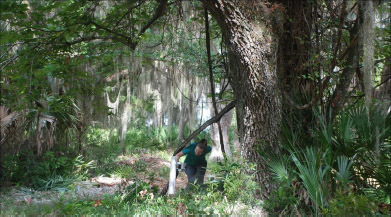 In the late summer of 2016, University of Kentucky archaeologist Richard Jefferies and his crew of graduate and undergraduate students returned to Sapelo Island to continue work on the Sapelo Island Mission Period Archaeological Project (or SIMPAP). Over the past 13 years, Jefferies and his colleague Christopher Moore, of the University of Indianapolis, have systematically investigated an expansive area north of the famous shell rings on Sapelo Island (Site 9Mc23). With a combination of extensive shovel probing, unit excavation, and geophysical prospection, the archaeologists have uncovered a wide range of mission-era evidence, including sherds of Spanish majolica pottery, pieces of olive jars, wrought-iron nails, glass beads, a small brass bell, an elegant cloth-covered button plausibly from a vestment, Altamaha sherds, and much evidence of Guale-Spanish interaction in Altamaha red-filmed colonoware. Cloth-covered button found in a Mission Period shell-filled pit. colony. For a time during this turbulent period, Indians from the north, including non-Christianized Yamasee, as well as Guale from other missions, considered Sapelo Island, with its own mission of San Joseph de Sapelo (or San José de Zapala) a safe haven. Today it is a long, gorgeous ferry ride from the mainland. 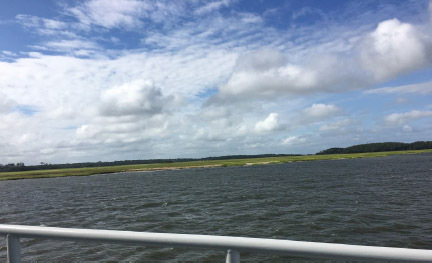 View of the sound, marsh and islands from the Sapelo Island ferry. analyze two 2x2-meter excavation units (Nos. 52 and 53) in the heart of this area. Jefferies took charge of the unit excavations, while training his undergraduate crew members in archaeological methods. University of Kentucky undergraduates made important contributions to the 2016 summer research program. In the course of excavating the first 2x2m unit, Jefferies detected a feature, regular stains of organic matter, which he thought might be the vestiges of a wall trench diagonally crossing the unit in a southeast to northwest direction. When he prepared to dig the adjacent unit 53, Jefferies decided to leave a 20 cm-thick earthen wall between the units to allow him to study the feature’s profile as it passed through this wall. The feature reappeared as expected in the new excavation unit once the upper 30 cm of soil was removed. Jefferies then dug a 45x45cm square into the feature to view it in cross section, where he discovered what began as a 15cm-long square nail. The blacksmith had shaped the nail at the forge into a curve, apparently to form a hook to hang pots or other items. The occurrence of this artifact, along with other architectural hardware from nearby, support the idea that the excavation units are exposing the remains of one or more Mission period structures. Jefferies and Moore will extend their investigations in this area next season. Large wrought iron nail or spike. Their project presents excellent educational opportunities for undergraduates. First-hand fieldwork is an essential supplement to the classroom and the laboratory. Students learn field methods with a mature archaeological project. For example, Abbie Webber, a second-year University of Kentucky (UK) Anthropology major, learned critical recording procedures for all phases of the excavation of a unit this summer. Among other things, she was put in charge of determining soil coloration of the excavation levels with Munsell color charts. Likewise, Chris Maynard, an undecided UK major, received a deep orientation to one of the areas he is considering for his future (archaeology). He was a jack-of-all-trades, pounding stakes, preparing grids, cutting underbrush, carrying heavy equipment, screening, and backfilling excavation units. fill, and conducting geophysical survey at site 9Mc23. The screening process is always one of the most enjoyable parts of an excavation, because of the inevitable surprises it holds. Even with eighth-inch mesh, screening of these sandy soils was comparatively easy. The bulk of the finds from the two 2x2m excavation units were mission-era Native American pottery sherds known as Altamaha in Georgia and San Marcos in Florida. They also found several pieces of Spanish majolica pottery. Abbie and Chris were especially excited to find a striking red-filmed sherd whose form showed the influence of Spanish vessels, attesting to the Spanish impact on the mission Indians. The discovery of Spanish glass beads was rare this season, but in the past screeners on the project have found an abundance of them in the immediate vicinity. xamples of Spanish majolica (left) and Native American-manufactured Altamaha Red Filmed (right) pottery found during the 2016 field season. A rare, surprising, and delightful find during screening was the recovery in an unambiguous mission-period context (level three of excavation unit 53) of an Archaic projectile point made of Georgia Coastal Plain chert. Prehistoric Indians made this weapon thousands of years before the mission was founded, about the time that the nearby ancient shell rings were constructed. As there is no rock at all, including chert, indigenous to the coastal islands like Sapelo Island, the Archaic point was an import brought to the island from the mainland. This artifact is a reminder that the hunter-gatherers who collected the millions of oysters and clams whose shells comprise much of the shell rings were also closely connected to the mainland and its many important natural resources. It is a rare find, as only a few other Archaic points have ever been reported on Sapelo. One of those Archaic points is today on display at the Sapelo Visitor Center. While Jefferies and his undergraduate crew members worked on the excavations, the UK graduate students took charge of the new geophysical surveys. The Department of Natural Resources preceded them with bush hogs to clear away as much of the palmettos and thick underbrush as possible. In the wake of the bush hogs, actual wild hogs, armadillos, snakes and lizards moved on to new habitats, perhaps realizing that these areas would be densely overgrown again within a few months. Unfortunately, the success of geophysical surveys depends on favorable conditions. The jungle-like terrain in this part of Sapelo is a real challenge. Even after the bush hogs had opened wide spaces for the surveys, all crew members had to wield axes and machetes to clear the many missed areas. Only then could they pound stakes and run ropes for the grids required for the ground-penetrating radar (GPR), and magnetometry. Dense undergrowth often impeded the progress of our geophysical surveys. be removed from the ground, because they survive only as stains of organic material, like the traces of the wall that Jefferies’ crew discovered and excavated. The use of multiple methods of geophysical prospection can potentially provide much data for analysis. Employing a fixed total station and a moveable prism pole, for instance, archaeologists can map location coordinates throughout a site, and use these coordinates to locate the precise positions of features captured by other means, such as ground-penetrating radar and magnetometry. Ground-penetrating radar sends an electromagnetic pulse into the ground, recording the depth of hidden materials by means of the pulse’s travel time. Magnetometry records magnetic variation in the soil at regular intervals and can help detect buried archaeological features, such as metal, brick, burned soil, postholes, beams, and other decayed organic matter. The use of geophysical equipment remarkably increased efficiency by forcing everyone in the area to shut down their iPhones. University of Kentucky anthropology graduate students conducting magnetometer (left) and ground penetrating radar (right) surveys. The summer project gave graduate students Vanessa Hanvey and Tyler Stumpf the opportunity to put newly acquired geophysical techniques to work. Previous geophysical feasibility surveys have suggested anomalies warranting further research in areas where the archaeologists have found Spanish artifacts and architectural features. The surveys this summer focused on areas north of and adjacent to them. The results of Hanvey and Stumpf 's GPR and magnetometer surveys produced numerous anomalies suggesting possible locations of additional mission-era structures. The area under investigation is an eclectic site, where many different cultures have resided over the millennia. For example, in a previous season the archaeologists found a figural clay pipe, which they dated to the Late Irene or early Altamaha period. Anthropomorphic clay pipe associated with the site’s Late Prehistoric or Mission period occupation. The archaeologists also found in another excavation unit a whelk shell that had been cut to form a drinking cup and decorated with incisions along its rim. The stains within suggest that it was likely used to hold the black drink, or cassina, around the time that the Spanish were starting the missions. It remains unclear who exactly inhabited this area. It is possible that the Guale, the original residents of the San Joseph mission and pueblo, vacated this site, moving to a safer, more remote area on the island, as the danger of raids by the English and their Indian allies, the Westo, increased. Perhaps Yamassee and other Guale refugees moved here trying to escape attack from the north by English-backed native groups. These refugees, who came from tribes that were not always compatible, may also have chosen to move to more secure, as yet undiscovered, places on the island, too. Although they have sought and found evidence of Spanish missions on Sapelo over the past hundred years, archaeologists and historians will be kept busy on this island for many more years to come. Acknowledgments: The author wishes to thank Richard Jefferies, Christopher Moore, Vanessa Hanvey and Tyler Stumpf for their contributions to this report. The Sapelo Island Mission Period Archaeology Project is made possible through the cooperation and support of the Georgia Department of Natural Resources, the staff of the Sapelo Island National Estuarine Research Reserve, and the residents of the Hog Hammock community on Sapelo Island. Photographs by Richard Jefferies and Kevin Kiernan. Richard W. Jefferies and Christopher R. Moore, “Recent Investigations of Mission Period Activity on Sapelo Island, Georgia,” Society for Georgia Archaeology, Special Publication No. 2, Journal of Global Initiatives 5.1 (2010), 67-85.
. “Mission San Joseph de Sapala: Mission Period Archaeological Research on Sapelo Island.” In Life among the Tides: Recent Archaeology on the Georgia Bight, edited by Victor D. Thompson and David Hurst Thomas, 345–374. American Museum of Natural History Anthropological Papers, Number 98. New York: American Museum of Natural History, 2013.
. “Mission San Joseph de Sapala: Seventeenth-Century Franciscan Mission Efforts on Sapelo Island, Georgia,” forthcoming 2016.